A sales strategy is just a specific way you expect to earn money in your business. I like to go through this process monthly, but you could set 90 day goals if that works better for you. 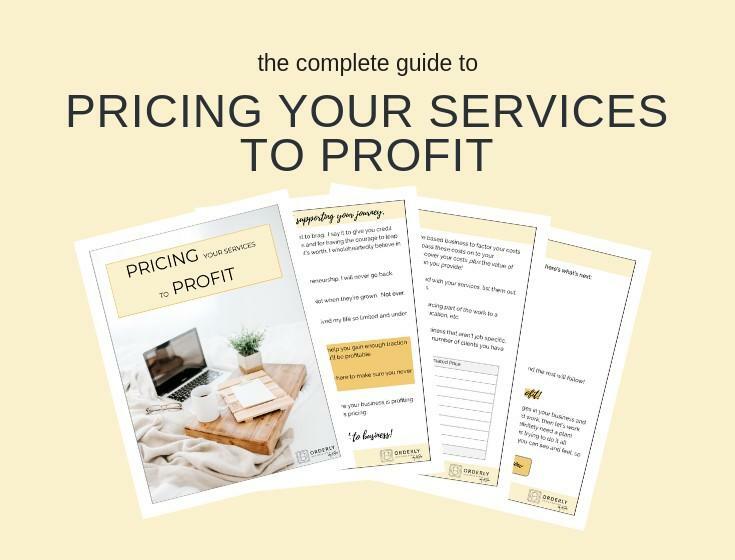 Essentially, you just jot down your different offers (your unique products or services), with a price for each and the quantity you expect to sell. 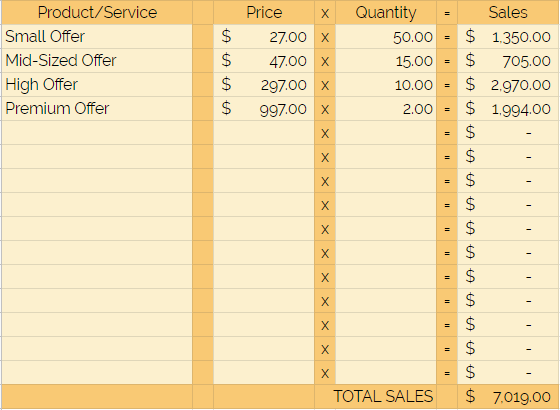 Then you add up the sales from each offer to come up with the total you expect to make in sales. I'll walk you through the 5 steps to setting a sales strategy to set and crush your goals below. If you love the simplicity of the chart above, this is actually 1 of 6 tools I offer in my Small Biz Starter Kit. It's called the Sales Goals Calculator. You adjust the offers, prices, and quantities and the workbook does the math for you. 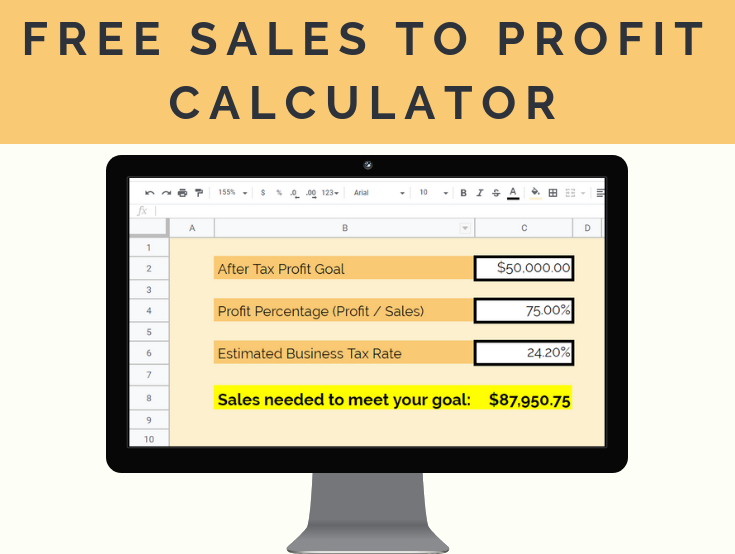 My favorite part is that you enter in your goals in one of the boxes and as you adjust, it compares your strategy to your goal and lets you know if you've met the goal or if you still need to come up with a way to add in more sales. It changes color based on if your goal is met or not and tells you exactly how much you have left to reach your goal, or by how much you've exceeded your goal. You can check out the entire Small Biz Starter Kit here. The first step in setting a sales strategy is simple - decide how much you want to sell. It's important to note that this can be adjusted as you go. One thing I love so much about playing with these numbers is that as you start to see how it adds up in black and white, you'll see it's actually not SO difficult to reach your goals, especially if you have multiple offers and different price points. So once you start seeing how many of each offer you have to sell to meet your goals, you may decide to increase your goal. In any case, the first step is to simply jot down how much you WANT to make and then go from there. The second step in setting a sales strategy is to map out your different products or services. In the chart above, you'll see there are 4 different offers at different price points. As the price goes up, the quantity you sell will likely go down, so it's great to have diversity in the products or services you offer. As an example, in my business, a $27 offer is a digital product that my customers buy at a promotional price. A premium offer is a one-on-one client; they take up more time, I have fewer of them, but the money I charge is greater. 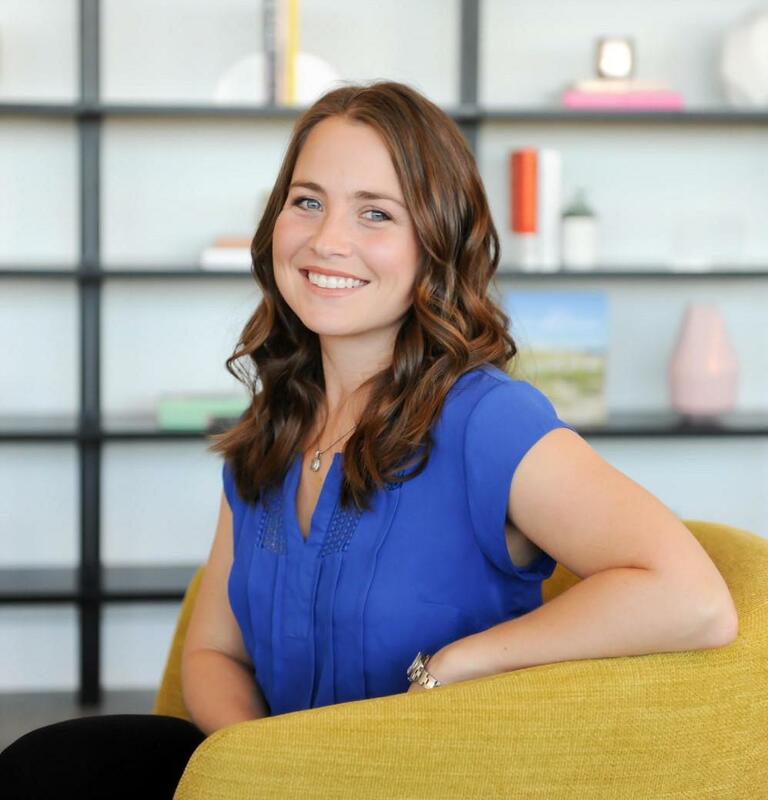 My smaller offers allow me to reach more people with a lot less work, so one thing you might want to do is figure out a way to add a small dollar offer to your business if you don't already have one. The third step to setting a sales strategy is to map out the prices of your offers and the quantity you expect to sell. In the example above, my first offer is $27 and I expect to sell 50 of them. $27 x 50 = $1,350. You'll go along, entering your prices and quantities for each offer. Try to be realistic here on how many people you can reach and if they'd be willing to buy the product. As an example, the standard "conversion rate" in e-commerce is 1-5%. That's how many people see your offer versus how many people buy. So if you're hoping to sell 50 digital products, you have to expect it to be seen by 1,000 to 5,000 people (I got this number by dividing 50 by .05 and .01). Conversion rates will vary based on your industry, but it's important to know how realistic it is to sell a certain quantity for YOU. If you don't know your conversion rate today, that's just fine. Jot down what you think will be reasonable, see how you do at the end of the month, and adjust accordingly. This process is not perfect and you will learn a tremendous amount by continuing to do it monthly. Once you've mapped out your offers, prices, and quantities, you just compare the result to your goal. Again, a simple way to do this is by using a spreadsheet and I offer a great one in my Small Biz Starter Kit. This will save time and frustration and avoid making a math error. If you're a pen and paper person, that's just fine, too. However you do it, just find a way that works for you and follow through. If your strategy exceeds your goal that's a great place to be. You can always increase your goal to meet your strategy, or leave it as is, allowing wiggle room. 3. Add a product or service. Continue fiddling around with the balance of offer, price, and quantity until your strategy equals or exceeds your goal! This stage of changing prices and quantities is why I love using a spreadsheet with formulas built in so much. As you make changes, the spreadsheet just updates itself without you needing to scratch out, erase, or start over! Once you have a sales strategy in place that meets or exceeds your goal, the real work begins. With an end point in mind, it's time to get out there and start making those sales. There is such power in numbers and knowing what you're striving for. If you have 2 sales already but know you need 4, you won't be complacent with the fact that some money is coming in, you'll work diligently to get two more sales and your follow through will be greater, which will give you a better result. Once the month has ended, it's time to compare your sales to your goals and set new goals for the next month. This process is never over. If you didn't meet your goals, you'll come in to the next month having learned a few things and adjusting to make it happen next time. If you do meet your goals, then you have room to set even higher goals and continue to grow as an entrepreneur! It's time to use what you've learned! Start mapping out your goals and strategy and get to work on crushing your goals!